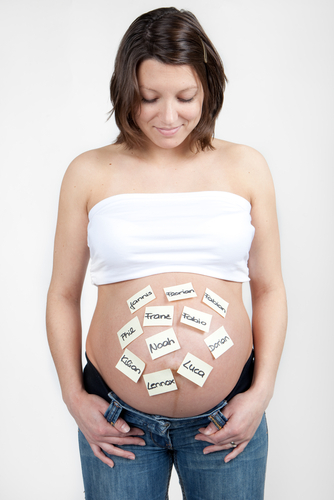 Naming your baby is a very personal decision, and one that your baby must live with for the rest of his or her life. While there is no set of rules regarding naming your baby, there are suggestions that one might follow. The biggest suggestion is common sense. Remember, your baby has to live with this name until he or she is at least eighteen. Even after that, he or she will still have the name that you chose at birth, despite legal changes. One major suggestion is to not name your child after an item. One woman had the name of Aquanet. While this is a beautiful name, it is also the name of the hairspray her mother used at the time of the woman’s birth. She was forever embarrassed by the fact that she was named after a hairspray. A celebrity who is often noted for such actions is Michel Jackson and his son, named Blanket. While it may seem like a great idea to name your child after your favorite thing or use a name of something else with a beautiful name, remember who has to live with it. Another suggestion is to not combine names. Taking one half of a name and mixing it with half of another name rarely turns out well. Instead it makes for a name that is difficult to pronounce and even more difficult to spell. Using one name or calling the child by a first and middle name is a lot easier on everyone. Just because you like it, does not mean your child will appreciate the mixed up name as he or she attempts to go to school or get a job. Remember the family names. Family names are great because they tie the child to the family in a wonderfully rich traditional way. Most families name their first sons after the patriarchs in the family. However, women can share the same name as well. How do you avoid confusion when they are all together? Middle names. Purchasing a baby book can provide one with great name suggestions. These books also often give the meanings of the baby names. This can be extremely helpful for those who are looking to give their child a powerful name with a powerful meaning. It also tells where the name originated so that one can choose a name from the country or region of one’s ancestors if one wishes to. Talking to family or friends can bring up problems or ideas for your baby’s name. These people are not connected to the event as much as you are, and therefore are able to view the name as a name, and not an emotion. These people can also give you an idea of how the name would be accepted among the child’s peers as he or she grows and how other adults will accept the child’s name. These people may even be able to suggest a beautiful name that you did not even think of.